Well I have been thinking and thinking and thinking about my next post. This is a very special post for me because this is my 50th one. Half a century! I wanted to do something different for this special post and trust me, I just couldn't think of anything. My mind had gone completely blank. If some idea flashed in my mind, moments later I would think, no that isn't good enough. I also didn't have a date in mind about my post, so I just kept on procrastinating in my typical way. And then suddenly on Friday I thought, enough of wasting time. I need to publish my post before Sunday, so I need to decide now what will be my 50th post. Surprisingly it took me only ten minutes to decide on my post. All these days of breaking my head over what to write was simply a waste of time. Have you ever seen the old tube-lights that keeps blinking? When I was a kid, in my room I had one such ancient one for some time. When you switch on this light, it used to do the following, first the corners of the tube will become orangish-red, then a sudden blink, then for next five minutes it will simply flicker and dance, and then it will pause a minute or two, and then a sudden flash and then finally it will be the "let there be light" moment. For this post my brain sort of worked in a very similar fashion like the old tube-light. I was looking staring at my blog and then suddenly the light inside my brain flashed. It's in the name of the blog, there you go..I have my ingredients staring at me..phew! What hard-work!! I certainly used up all my brain cells to figure that out. Anyway after that the rest is quite simple. I went to the supermarket, bought what I wanted. Got honked once (really hard) in a traffic roundabout. And a few minutes later scared an old man to death by my driving. No, the old man wasn't the one who honked me in the roundabout. These were two completely separate incidents that happened to me within five minutes of one another!!. Anyway, I reached home in one piece. I sat there in my car and was trying to think, did I just avoid a deadly accident or it wasn't my fault at all in the roundabout. I hope my parents aren't reading my blog, otherwise there will be a permanent ban on my driving. After such an eventful afternoon, I decided not to make the dish on Friday evening as I wasn't able to concentrate very well and I didn't wanted my dish also to spoil like my afternoon. I needed a fresh start for my special dish and my 50th post. So here you go..my special dish is Chilli & Chocolate fondue which I prepared on Saturday afternoon and enjoyed it with marshmallows and sponge-fingers. I hope you like it too. Enjoy! 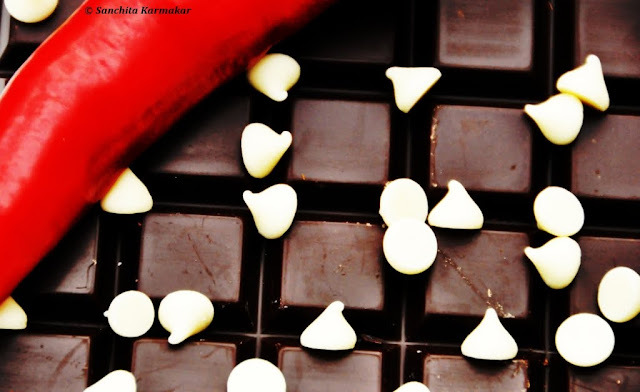 Melt the chocolate in a bain-marie and add the chopped red chilli. Heat the double cream in a different container, do not boil. Now add the cream, red chilli powder and the rum to the melted chocolate mixture and remove from heat. Mix well and pour it onto a fondue dish. Serve it with either strawberries, marshmallows or sponge-fingers. These images are exquisite. The chilli on top of chocolate, i loved it. Well congrats on your 50th post. 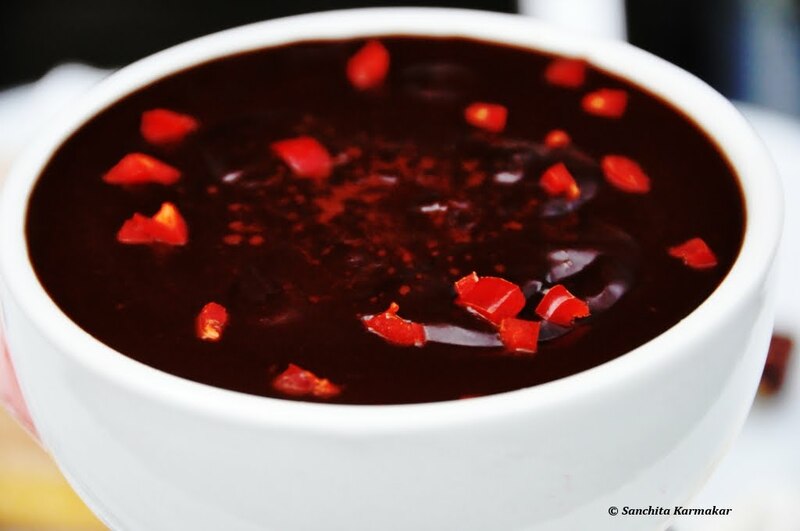 Well, chocolate and chilli, intersting combination, will try it someday. Well all the best for further posts. 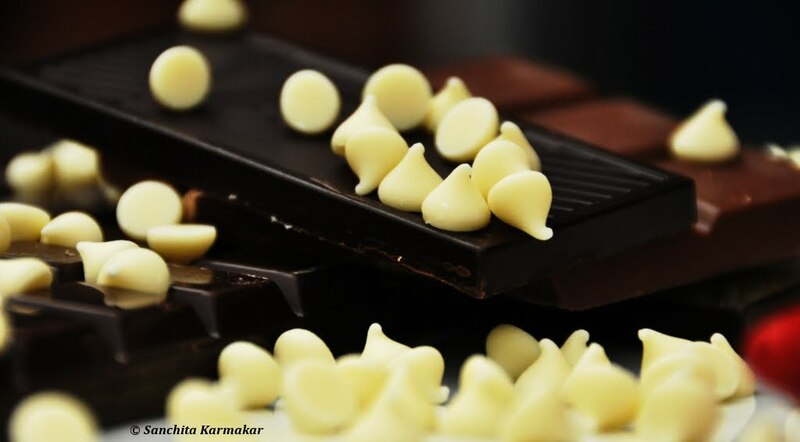 Chocolate and chillies, what a delightful combination! Reminds me of the movie "Chocolat"! Beautiful and indulgent pictures of the fondue. I must try this out soon! Gracias! Awesome pictures. Looks very yummy indeed. I must try it out!! Congrats on your 50th post! Sanchita - first time in your blog - congrats on your 50th post. A very special achievement indeed. I love the pictures. 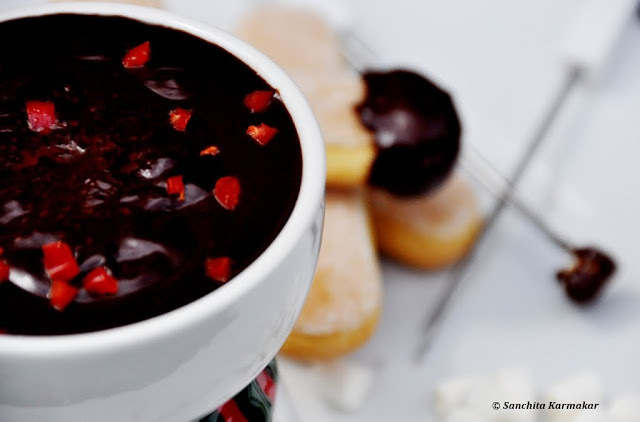 The chilli and chocolate combination looks very delicious! Congratulations on a successsful blog! What a perfect recipe for a get together. It will go down like a treat. Thanks Sanchita! Congrats !! Lovely shots ! Wonderful cuisines ... Great pictures too !!! Loved this wonderful n innovative combination !!! hi, i am pleased to present you with an award that's waiting on my blog. hi..this is neethu here :)... plzz dod rop in at my small world of cookery and share ur thoughts..
do add urself to my friend list.i would love u to be one my nloggy friend :)..
Congrats on your 50th post, chilli and chocolate are my favourite too. Nice pictures. Fondue looks incredible..love that red chilli twist in it..btw, congrats on your 5oth post..wishing you many more such milestones ahead..keep blogging..will love to read every wonderful post from you..have a nice weekend..tk care! Hi sanchita, came here through sharmi's blog n you created a very good first impression..i guess i have 2 come often. btw congrats on your milestone , wish you many more 2 come!